Happy Wednesday! This is Stephanie from Steph in Thyme. Today, I’m sharing a simple, yet crazy delicious pasta salad that’s perfect for a summer picnic. So perfect, I have no other choice but to call it Picnic Perfect Pasta Salad. After the long weekend, I still have picnics on the brain. All I want to eat is food fresh from the grill along with an array of diverse sides running along the length of an outdoor table. That’s not too much to ask, right? I love summer not for the warm days or trips to the beach, but for the large potluck gatherings and picnics. I love exploring recipes I wouldn’t ordinarily make at home for CJ (the husband) and myself. Cooking and baking for a crowd is so much more fun. All picnics need a pasta salad, a scoop of carby goodness on the side of the plate (or, my entire plate) to energize the lawn games and activity until the sun sets. Creamy mayo-based pasta salads, glorious as they are, can feel so heavy. It’s also tricky to keep them chilled outdoors, especially on a warm day. A tangy peanut dressing lightly coats the pasta, giving it that “must have more” essence – but without the guilt. This dressing isn’t loaded with lots of peanut butter or even added oil. It consists of creamy peanut butter (only three tablespoons for the entire pasta salad), gluten-free soy sauce, lime juice, unseasoned rice vinegar, water, and red pepper flakes. Blended until smooth, it’s a flavorful and mayo-less way to mix things up at your next picnic. If you’re attending a picnic with gluten-free guests, this pasta salad is an excellent addition to the buffet table because everyone can eat it. And those who aren’t gluten-free won’t notice a difference. I prefer to use Fusilli pasta for this salad because I find it easier to eat. In addition to holding the sauce better, preventing it from pooling at the bottom of the bowl, the spirals and ridges make it easier to piece the Fusilli with your fork. And the pasta stays on the fork, too! Penne, with its smooth surface, tends to slide or fall off the fork, especially with sauce coating it. Elbows and smaller pasta will work, as long as you have spoons on hand. I mentioned that gluten-free soy sauce is used in the peanut dressing. Soy sauce actually contains wheat and is one of those hidden dangers for those following a gluten-free diet. Now, if you’re going to a picnic where gluten isn’t an issue for any of the guests, you can certainly use regular soy sauce as well as regular pasta. The peanut sauce adds tang, but the medley of fresh veggies bring color and texture. Red bell pepper and cucumber, thinly sliced scallions, shredded carrots, cubed avocado, and shelled edamame. I love the contrast between the crunchy vegetables and the creamy soft avocado, especially when it’s perfectly ripe. 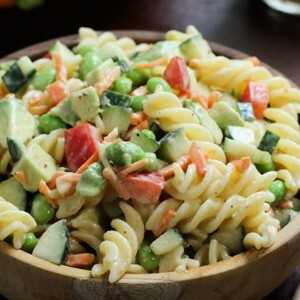 The edamame give this salad a boost of protein, so if all you want to eat at the picnic is this pasta salad, it’s at least a well rounded meal. I would love to hear from you! What’s your favorite picnic dish? Are you known for any particular potluck recipe? Cook the pasta according to package directions. Drain and rinse under cold water to stop the cooking process. Set aside. In a large bowl, combine the bell pepper, cucumber, scallions, carrots, edamame, and avocado. Set aside. Add the peanut dressing ingredients to a blender, blending until smooth. Add the rinsed and drained pasta to the bowl with the vegetables. Pour the peanut dressing over top. Toss to combine, adding additional salt and pepper, if needed. Serve immediately, or store in the fridge for a few hours prior to serving. Hello, and Happy Holidays! This is Stephanie from Steph in Thyme, and today I’m sharing a classic Christmas cookie recipe my family has been baking since I can remember…but modified gluten-free. This recipe is barely adapted from the Super Spritz Cookie recipe that came with my mom’s Super Spritz electronic cookie press she’s had as long as I can remember (we’re talking 20+ years). 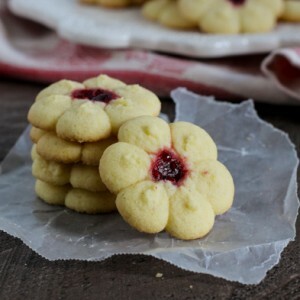 Simple, buttery sugar cookies pressed into a flower design, the centers filled with raspberry jam (with the seeds!). Such a lovely and festive addition to a holiday cookie tray or gift plate. My sisters and I had the job of carefully placing a bit of jam in the center of each cookie, cautious not to overfill as the jam will spill over and fill the cracks of the petals. My sisters and I had the job of carefully placing a bit of jam in the center of each cookie, cautious not to overfill as the jam will spill over and fill the cracks of the petals. In place of regular flour, I used King Arthur’s Gluten-Free Multi-Purpose Flour. Bob’s Red Mill 1:1 Gluten-Free Baking Flour is another great gluten-free baking mix. When I use these gluten-free flour mixes in my Christmas cookies, I can’t notice the difference. I used a cookie press by OXO Good Grips to create the little flower designs. Simple to assemble, use, and clean. A great find at Bed Bath & Beyond. These gluten-free Christmas sugar cookies are a fun wintery activity with kids. Have fun, and Happy Holidays! Cream the butter with an electric stand mixer or hand mixer. Add the sugar a little bit at a time as you continue to run the mixer, beating until creamed, fluffy, and light. Add the egg yolks one at a time, followed by the vanilla and salt. Mix well to combine. Add the flour 1/3 at a time, mixing well in between until a stiff dough forms. Assemble and fill the cookie press. Press floral design cookies onto an ungreased cookie sheet about 2 inches apart. Using a chopstick or something similar, create a small hole in the center of each cookie. Fill the hole with about 1/8 tsp raspberry jam. Bake cookies for 8-10 minutes until very lightly golden brown. They overbake and turn brown quickly, so keep a close eye at the 7 minute mark! Remove cookies from oven and let cool completely on a wire rack. Hello, and Happy Weekend! This is Stephanie from Steph in Thyme, and today I’m sharing another recipe for healthy homemade veggie chips. 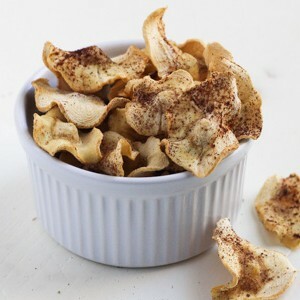 Subtly sweet but also savory, these Cinnamon Parsnip Chips are a healthy gluten-free grab-and-go snack. Last week, I shared a recipe for Truffle and Garlic Kale Chips. So easy, tasty, and healthy, homemade veggie chips are a refreshing take on everyday snacking. Start by peeling a large parsnip and then using a mandoline slicer to thinly slice a little larger than paper thin. Using a mandoline slices ensures that the slices are thin and even. It’s also super quick to slice with this handy kitchen tool, much easier than slicing by hand!. And when sliced super thin, they get all curly and pretty. Arrange the parsnip chips in a single layer on a rimmed baking sheet lined with parchment paper. Lightly spray the chips with non-stick cooking spray, then sprinkle with a light dusting of cinnamon. To dust lightly, hold the ground cinnamon container up high – I mean a good foot to foot and a half above the baking chips. Lightly tap your finger on the bottle to shake out just a bit of ground cinnamon. A light dusting is all you need. Flip the chips and repeat so both sides are coated. Bake until light, dry and crispy…and voila! The parsnip has that light earthy flavor of a root vegetable, with just a hint of subtle sweetness. The dusting of cinnamon seasons them to spiced perfection for fall. Pair with your favorite dip, or munch on plain. Store in an airtight container to keep the chips fresh if you don’t eat them all right away. Pre-heat oven to 275 F. Line 2-3 large rimmed baking sheets with parchment paper. Peel the parsnip and trim the tough ends. Using a mandoline slicer or a sharp knife, slice the parsnip into paper thin chips. Arrange the chips in a single layer on the baking sheets. Spray lightly with canola or olive oil cooking spray. Lightly dust with cinnamon. Flip chips and repeat. Bake chips, one baking sheet at a time, for 25-35 minutes or until dry and crispy. Flip halfway through. Remove from oven and scoop chips into a large bowl. Enjoy immediately, or store in an airtight container for 2-5 days. Hello! This is Stephanie from Steph in Thyme, and today I’m sharing a healthy snack recipe with a simple, yet gourmet twist. These Truffle & Garlic Kale Chips are super easy to prepare but rich with flavor. Pour a big bowl, they’ll go fast! One of my favorite ways to eat kale is baked into chips. Crispy, light as air, and much healthier than your corn or potato-based chips. The curly variety of kale with its tight leafy folds creates delicious chips full of texture and crunch. Simply slice away the stems and tough inner ribs of the kale and tear the leaves into a little larger than bite-sized pieces (they’ll shrink down as they cook). Add the kale pieces to a large mixing bowl and drizzle a teaspoon of olive oil over top. Use your hands to massage the oil into the kale. And I mean really massage the kale – it sounds odd, but use your whole hand and pretend you’re giving someone a shoulder rub. This motion thoroughly coats the kale pieces with the oil all the way into the curly crevices. Finish the kale chips with a dusting of garlic powder and sprinkle of black truffle salt. This salt is one of my favorite ingredients. A little container seems expensive, but that little container goes a long way. Just a hint of truffle salt adds such a huge flavor boost to a wide array of foods. Popcorn, roasted vegetables, soup, mac & cheese. So many possibilities. Even if you use the salt often (like me), you won’t run out of it quickly because you only use a teensy bit at a time. I bought my truffle salt at a boutique olive oil store in Saratoga Springs, but specialty stores like Sur La Table sell truffle salt. You can also purchase it on Amazon. I highly recommend – it is DIVINE. Once the kale chips are oiled and seasoned, arrange the pieces in a single layer on a baking sheet lined with either parchment paper or a silicone mat. Bake at a low heat, 250 F, for 25-30 minutes until the chips are dried out and crispy, but not browned. Enjoy the chips right away, or store in an air-tight container to munch on later. These chips are addicting, so full of crispy crunch. Light as air, melting in your mouth. The flavors of garlic and truffle are rich but not overpowering, cultivating a craving that urges your hand to reach for more. I bet you can’t eat just one…but unlike potato chips, you won’t have the guilt if you eat the whole bag! Preheat oven to 250 F. Line a large rimmed baking sheet with a silicone mat or parchment paper. Place the trimmed kale pieces in a large mixing bowl. Drizzle olive oil over the kale then massage with your hands until pieces are completely coated. 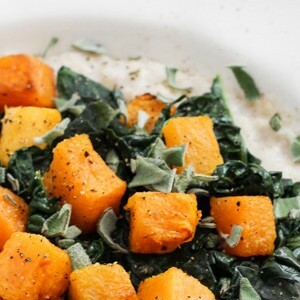 Sprinkle salt and garlic powder over the kale and toss lightly to coat. Arrange the kale pieces in a single layer on the baking sheet. Bake for 25-30 minutes until the kale pieces have dried out and are crispy, but not browned. 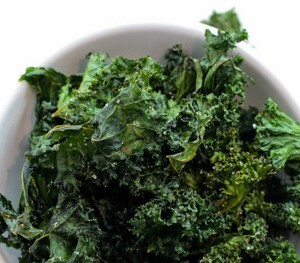 Remove baking sheet from the oven and pour kale chips into a serving bowl. Sprinkle additional truffle salt on top, if desired. Serve immediately or store in an airtight container for 3-5 days. Hello! This is Stephanie from Steph in Thyme, and today I’m sharing a recipe for a hearty slaw perfect for fall. 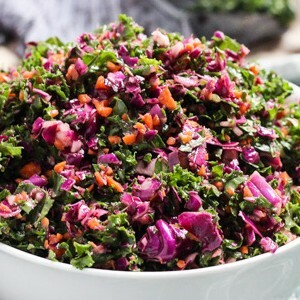 Loaded with kale, purple cabbage, carrots and tossed in a tangy shallot vinaigrette, this easy Kale, Cabbage, and Carrot Fall Slaw is a nutrient dense and colorful side dish. Just because fall is here doesn’t mean we have to bid adieu to slaw. One of my favorite fall/winter variations embraces deep colors and flavors of seasonal vegetables – curly kale, carrots, and purple cabbage. To save time and whip up this side dish quickly, I turn to my food processor to finely chop all the ingredients. A few pulses does the trick to evenly chop the vegetables while also leaving enough texture so the slaw isn’t mushy. I have found that one bunch of curly kale, one small head of purple cabbage, and 4-6 medium carrots are a good ratio of both color and flavor. Of course, you can tweak the ratios per your taste preference and according to the size veggies you purchase. The shallot vinaigrette is light and tangy, adding a zippy flavor to the deep and earthy flavors of the vegetables. 1/3 cup of olive oil seems like a lot, but this is a dense salad. 1/3 cup stretches the vinaigrette enough to completely coat the ingredients without drowning them. I chill this slaw in the fridge for 1-2 hours before serving to allow all the flavors to meld. This slaw is tasty as a side to pretty much anything and is even delicious added to salads for additional texture and flavor. Rinse the kale and shake/pat dry or dry using a salad spinner. Remove the tough inner ribs. Working in batches, pulse a few times in a food processor until finely chopped (not minced into super tiny pieces, enough to have texture). Pour the chopped kale into a large bowl. Remove the tough outer leaves of the head of cabbage. Slice in half and trim away the white, tough inner core. Slice into chunks and load into a food processor, working in batches depending on the size of your food processor. Pulse until finely chopped. Add chopped cabbage to the bowl of kale. Peel the carrots and trim the ends. Slice into 1" pieces and pulse in a food processor until finely chopped. Add the carrots to the bowl of cabbage and kale. In a small mixing bowl, combine the minced shallots and dijon mustard. Add the red wine vinegar and whisk to combine. Very slowly pour in the olive oil, whisking vigorously as you do so, to emulsify the vinaigrette. Season to taste with salt and pepper. Pour over the slaw. Toss slaw and dressing until combined and well coated. Cover and chill in the refrigerator for 1-2 hours to allow all the flavors to meld. Toss and adjust salt and pepper seasoning before serving. Hello, and Happy Fall! This is Steph from Steph in Thyme, and today I’m sharing a healthy, yet still super delicious, approach to Game-Day snacking. This Smoky Eggplant Dip is hearty and rich in flavor, perfect for the change in seasons and when the munchies strike watching weekend football. 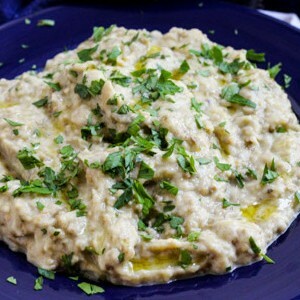 Another name for this dip is Baba Ganoush, a traditional Levantine dish. The base is eggplant baked, boiled, or grilled whole so the inside “meat” is soft with a deep smoky flavor. I prefer to grill the eggplant, first pricking it all over with a fork. Set both eggplant on the grill, close the lid, and let them cook for about 30-40 minutes, rotating with tongs occasionally. You want the eggplant to blacken and collapse, like it’s about to fall apart. Once completely collapsed, open up the eggplant and scoop out the soft and tender meaty innards. No grill? No problem. You can cook the eggplant under the broiler instead, rotating occasionally with tongs until they look like this below. Tahini (aka sesame paste), lots of lemon juice, even more garlic, and salt and pepper finish off the dip. The result is an appetizer with a very hearty texture and rich, deep flavors. The dip tastes best after it chills for several hours, the flavors melding and opening up to a whole new level. Garnish the dip with chopped fresh parsley and a drizzle of olive oil and serve with warm pita triangles, fresh veggies, or hearty crackers. It goes quickly, so you may want to make a double batch! Rinse both eggplant and pat dry. Prick each eggplant all over with a fork. Pre-heat grill over medium-high heat. Place the eggplant whole on the grill and close the lid. Cook for 30-40 minutes, rotating occasionally with tongs to eggplant cooks evenly, or until eggplant are blackened and collapsed. Remove eggplant from grill and let sit for 15-20 minutes until cool enough to handle. With your fingers, open the eggplant and scoop all the soft insides into a bowl. Mash the cooked eggplant "meat" with a fork until mashed and no large chunks remain. Add the tahini, crushed garlic, lemon juice, and salt and pepper to the eggplant and stir until well combined. Make sure to season well with salt, adjusting amount to taste. Cover the dip and chill for several hours to let the flavors come together and open up. Adjust seasoning as needed after it chills, i.e. add more lemon, tahini, salt and pepper. Some like this dip more lemony, some with more tahini (me!) Adjust to your particular taste. To serve, scoop the dip into a serving dish. Sprinkle topped parsley over top and a drizzle of olive oil. Serve with warm pita bread, fresh veggies, or hearty crackers. Hello, Friends! This is Stephanie from Steph in Thyme, and today I’m sharing another of my favorite spiralized recipes – Spiralized Zucchini Noodles with a Mushroom Marinara. It’s a healthy, gluten-free, delicious Meatless Monday meal ready in less than a half hour. Who is ready to spiralize?? 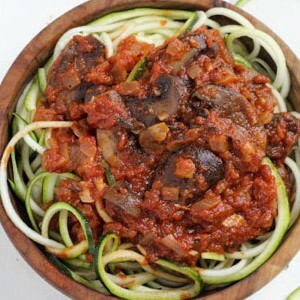 A few months ago, I shared a recipe for Spiralized Zucchini Noodles with a Simple Roasted Tomato Sauce. Quick and light, this easy spiralized recipe was perfect for hot days as we moved into the summer months. With fall on the horizon, a slight chill fringing the air, the simple roasted tomato sauce is swapped for a heartier, “meatier” sauce. Chock full of fresh mushrooms, this warm and filling meal is a tasty transition meal between summer and fall. A full pound of cremini mushrooms are used in this tomato sauce, the meaty nature of the mushrooms creating an earthy sauce thick and filling, but still healthy and delicious. Zucchini noodles, created with a handy kitchen gadget called a Spiralizer, are a creative and very healthy (and sneaky) way to increase your vegetable intake. If you’re curious about spiralizing and want to learn more, I have lots of spiralizing resources and recipes for you. This quick and easy meatless meal is very customizable. Looking for a richer sauce? Add a 1/4 cup of red wine to the simmering pot. Craving a spicier kick? Add a 1/2 teaspoon of crushed red pepper. In the mood for something slightly more creamy? Add Parmesan cheese, both to the sauce and on top of your bowl of zucchini noodles. Whatever you’re craving, it’s a meal you can make your way. Wash and trim the ends off all zucchini. Spiralize each zucchini into spaghetti size noodles (Blade C for most spiralizers). If you don't have a spiralizer, peel the zucchini with a julienne peeler. Heat half the olive oil in a medium-sized saucepan over medium-high heat. Add the onion and cook for 2-3 minutes, until softened. Add half of the minced garlic and cook until fragrant, about 1 minute. Add all of the sliced mushrooms and toss lightly to coat. Cover and cook for 5 minutes, until the mushrooms soften, but still have texture. Remove lid and pour in the marinara sauce. Cook for another 5 minutes, until the sauce begins to boil and is heated through. Add red wine and crushed red pepper, if desired. Reduce heat to simmer as you prepare the zucchini noodles. In a separate saucepan or skillet, heat the remaining olive oil over medium-high heat. Add the remaining garlic and cook until fragrant, about 30 seconds. Add in all the zucchini and toss with tongs to coat. Season generously with salt and pepper. Cook for 1-2 minutes, until zucchini begins to soften but still has texture and bite (they overcook and turn soft fast!) Remove from heat. Divide the zucchini noodles amongst four bowls. Top each bowl with a hearty servings of mushroom marinara. Garnish with Parmesan cheese, if desired. Serve immediately. Hello, and Happy Friday! This is Steph from Steph in Thyme, and today I’m sharing a recipe for a flavorful and fluffy Honey and Buttermilk Gluten-Free Cornbread. This cornbread is subtly sweet and packed with golden corn for a delicious gluten-free breakfast or snack. I fell in love with thick, hearty slabs of golden cornbread while living in Montgomery, Alabama – twice (dad was in the USAF for 30 years). Still warm from the oven, slathered with sweet cream butter or fresh berry jam. Sigh. The stuff of dreams, my food friends. 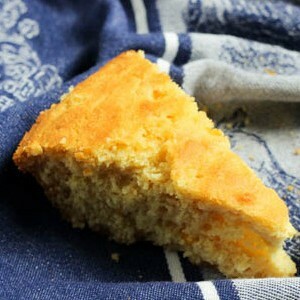 One thing I noticed about cornbread is that it can sometimes be very sweet — almost dessert-like. Also, many slabs I encountered didn’t have any corn in the bread. Maybe I’m taking things too literally, but I want CORN in my cornbread! This Gluten-Free Cornbread is subtly sweetened with honey, which gives each slice just enough sweetness without going overboard. This cornbread also has a full cup of golden corn kernels, so you get corn with each and every bite. Buttermilk gives this bread an almost creamy fluffiness. You would never guess it’s gluten-free. In place of all-purpose flour, I used Gluten-Free Bisquick. Yes – Bisquick comes GLUTEN-FREE. It makes wonderful pancakes, cobbler topping, and more. Other than that, there are no “special” gluten-free ingredients. Easy peasy. This Gluten-Free Cornbread is thick, fluffy, light, moist, has good crumb – all those wonderful things about cornbread…but gluten-free. My favorite way to savor every morsel is with a spoonful of Blackberry Chia Seed Jam I recently made. The touch of almond extract and berry bursting flavor are a heavenly combination with this glorious Gluten-Free Cornbread. Pre-heat oven to 375 F. Coat a 8x8 dish or a pie dish with non-stick cooking spray. In a small bowl, melt the butter. Set aside to cool until the butter is slightly warm, not piping hot. In a separate mixing bowl, whisk together the egg, honey, and applesauce. Add the melted butter until well combined. Finally, add the buttermilk and whisk again to combine. Make a large well in the center of the dry ingredients. Pour the wet ingredients into the well. Begin whisking in circular motions, pulling in the dry ingredients to the wet ingredients slowly until all ingredients are combined. Fold in the corn kernels. Pour the cornmeal batter into the oiled dish. Slice the tablespoon of cold butter into six pieces and arrange around the top of the cornbread. Bake at 375 F for 25-30 minutes until a toothpick in the center comes out clean and the top is golden brown and firm to the touch. Slice and serve - it's best served warm! Happy Monday! This is Stephanie from Steph in Thyme, and today I am sharing a healthy side dish for your next supper or picnic. This Gluten-Free Summer Quinoa Salad is filled with sweet and savory flavors for a light, refreshing, and healthy summer side. My aunt made a variation of this quinoa salad a few years ago at a Labor Day picnic. I’ve never been the biggest fan of fruit in salads, preferring a purely savory plate. Load up the veggies, but add in fruit? Heavens, no! Well, all that changed with this Summer Quinoa Salad. I was pleasantly surprised how much I loved the sweet and savory flavors together in one bite. The sweetness of the seedless grapes and ripe blueberries contrast nicely against the tangy crumbled feta, crisp cucumber, and savory vinaigrette. The fresh fruit also adds color and texture to the dish, each bite chock full of ripe fruit and creamy feta. For a bit of crunch, I recommend adding a few tablespoons of pine nuts or walnuts. 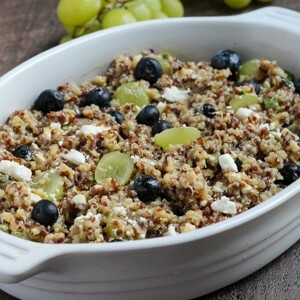 Quinoa, the base of this salad, is one of the healthiest foods on the planet, first cultivated over 5,000 years ago by the Incas who considered it “the Mother of all Grains.” Quinoa is naturally gluten-free, rich in fiber, and high in protein (in addition to numerous other health benefits). Red and white quinoa have slightly different textures – white quinoa creamier and softer, red quinoa maintaining more of a bite after cooking. I often combine the two together for a blend of textures and colors. For added flavor, I always cook the quinoa in broth versus water. The vinaigrette is oh so simple – red wine vinegar and dijon mustard whisked together with olive oil, salt, and pepper. That’s it! (If you’re following a gluten-free diet, check to make sure that the mustard you are using is gluten-free. The vinegar in mustard may have been distilled from gluten grains, posing a reaction risk). This salad is delicious served chilled or slightly warm (my preference). So healthy and simple, but rich with flavor and texture. Grab a fork and dig in! A delicious and refreshing quinoa salad with crumbled feta, fresh grapes, blueberries, and cucumbers tossed in a simple vinaigrette. In a medium saucepan, combine the quinoa and broth. Heat over medium and bring to a boil. Once boiling, reduce heat to low and cover. Simmer for 15 minutes, or until liquid is absorbed. Transfer quinoa to a bowl and fluff with a fork. Set aside to cool. In a small bowl, whisk the red wine vinegar and mustard together. Slowly pour in the olive oil, whisking vigorously as you do. Season vinaigrette to taste with salt and pepper. Place the blueberries, feta, cucumber, and grapes in a large bowl. Pour the cooled quinoa over top. Add the vinaigrette and toss gently to coat and combine the ingredients. Season to taste with additional salt and pepper. Serve immediately, or cover and chill in the refrigerator prior to serving. You can certainly adjust the quantities of fruit, adding more or less according to preference and taste. Happy Monday! This is Stephanie from Steph in Thyme, and today I’m sharing a dessert that was a hit at a big barbeque we hosted this past weekend at our new house. These Chocolate Peanut Butter Chex Treats are gluten-free, but also a crowd pleasing dessert anyone will enjoy (and they did). I find it hard to say “no” to a chewy, crunchy, marshmallowy treat at a summer picnic. Even more so when they are packed with rich chocolate and creamy peanut butter, such a decadent combination. These treats are very simple and easy to prepare. Just melt, mix, chill, and serve. The base of these treats is indulgent chocolate of Gluten-Free Chocolate Chex cereal. Chex has come out with a whole line of gluten-free cereals with fun, delicious flavors – Vanilla, Honey Nut, Cinnamon, and Apple Cinnamon…and of course, Chocolate. If you eat the Chocolate Chex in a bowl of cold milk, the milk transforms into rich chocolate milk, the chex maintaining a crunchy texture, never turning soggy. But I digress, back to Chex Treats. Almost a full cup of creamy peanut butter is melted along with marshmallows and unsalted butter, then poured over a big bowl filled with eight cups (nearly an entire box) of Chocolate Chex. 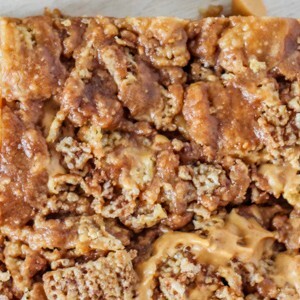 After everything is mixed together, peanut butter chips are folded in, partially melting into the gooey chex batter, leaving stripes of peanut butter in the sliced Chex Treats. These Chex Treats don’t skimp on the chocolate and peanut butter flavors. The Chocolate Chex, held together by creamy peanut butter and melted peanut butter chips, are rich with flavor and an addicting chewy, crunchy texture. I like to serve these bars slightly chilled and sliced into bite-sized treat sizes, especially if I’m serving these at a picnic. Guests clamored to taste the small bite-sized portions, coming back for seconds and thirds throughout the picnic – and most of these people were not strictly gluten-free. These Chocolate Peanut Butter Chex Treats are a fun, flavorful dessert made with gluten-free folks in mind, but are a dessert anyone will enjoy. Chewy Chocolate and Peanut Butter Chex Treats, a quick dessert that will please a crowd, not just those who are gluten-free! Line a 9x13 pan with parchment paper, or grease with non-stick cooking spray. Place 8 cups of Chocolate Chex in a large bowl, set aside. In a medium-sized pot, melt the butter and peanut butter together over medium heat. Add the marshmallows and stir frequently until melted and completely blended with the butter and peanut butter. Remove pot from heat and pour melted contents over the chocolate chex. Mix together with a spatula until well coated. Fold in the peanut butter chips. Pour contents of the bowl into the center of a 9x13 pan. With a spatula, or with your hand enclosed in a greased baggie, spread out the chex evenly into all four corners of the pan. Let pan sit at room temperature for a half hour. Cover and chill in the fridge for another hour. Slice into desired square sizes and serve. Hello, and Happy Friday! This is Stephanie from Steph in Thyme, and today I’m sharing a recipe for a healthy – yet protein packed – breakfast. 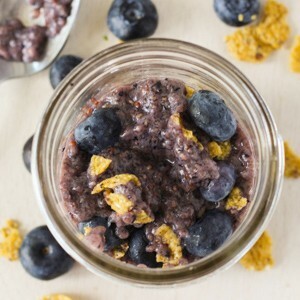 Bursting with blueberries, this Blueberry Chia Breakfast Pudding is thick and hearty, yet light and refreshing for a summer morning. If you’ve never experienced chia pudding before, I have the weekend activity for you. Chia Seeds are among the healthiest foods on the planet, packed with fiber, protein, and Omega-3 fatty acids. While chia seeds are flavorless, it’s the texture that takes some getting used to. These teeny tiny little seeds expand and swell when placed in liquid, soaking up to twelve times their dry weight. They transform into little gel-like globules, which makes consumption a bit of a slippery endeavor. I’ll admit, chia pudding took some getting used to because of its flubber-like consistency. Now that I’ve accepted how chia pudding feels on my tongue, I can’t get enough. I’ve made a Papaya Coconut Chia Pudding and eaten it for both breakfast and dessert on the same day. This version embraces summer blueberries, ripe and plump, for a colorful and healthy start to the day. The pudding itself is very easy and quick to put together. Simply purée almond milk, blueberries, and agave in a blender and combine with a quarter cup of chia seeds – a little bit goes a long way! You can chill the chia pudding overnight and eat it first thing in the morning, or allow it to chill the day of for 2 to 4 hours. If you don’t want to use almond milk, you can use cashew milk, soy milk, or coconut milk instead. Once the chia pudding has chilled and thickened, divide it into bowls and top with your favorite granola and additional blueberries. While thick, the pudding is also light and refreshing – the perfect way to start the day in summer. I would love to hear from you. Are you a chia pudding fan? What’s your favorite way to prepare it? If you try chia pudding for the first time, let me know what you think! In a blender, combine almond milk, 3/4 cup blueberries, and agave. Blend until smooth. Pour the contents of the blender into a medium bowl. Add the chia seeds and stir until well combined. Cover and refrigerate for 2-4 hours, stirring occasionally to break up any chia clumps that may have formed. Pudding is ready when it has thickened, the chia seeds softened. Divide the pudding into 2 bowls, for larger servings, or 4 bowls, for smaller servings. Top with additional 1/2 cup blueberries and granola, if desired. Serve immediately.